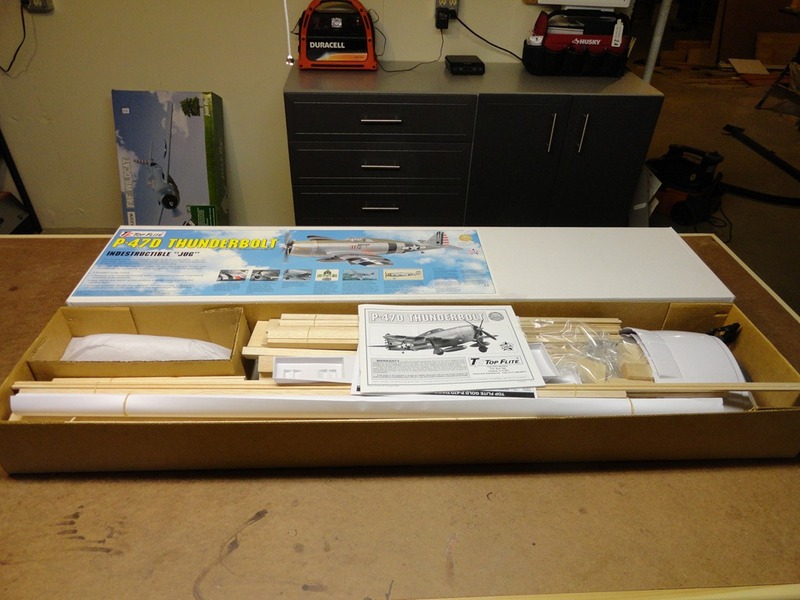 I got back from my last business trip last week to find that the postman had delivered my Great Planes building board. The surface is smooth and flat and looks like it will be a big step up from the old ceiling tile building board I have been using. My only concern is that there is a small split along one of the edge glued joints at one end. I am leaving it alone for now, but may squirt a bit of wood glue into the split and clamp it up to ensure that it does not spread. Not much new progress this week (too many other obligations). Just got the sheeting onto the top of the stab. I decided to install these with aliphatic resin (yellow wood glue) instead of CA. I prefer this as it is slow drying, giving you time to ‘fuss’ with the pieces and because it produces a very light-weight but very strong bond. Initially, I was having some difficulty curving the leading edge, so I separated the parts and wiped the glue clean with a damp cloth. 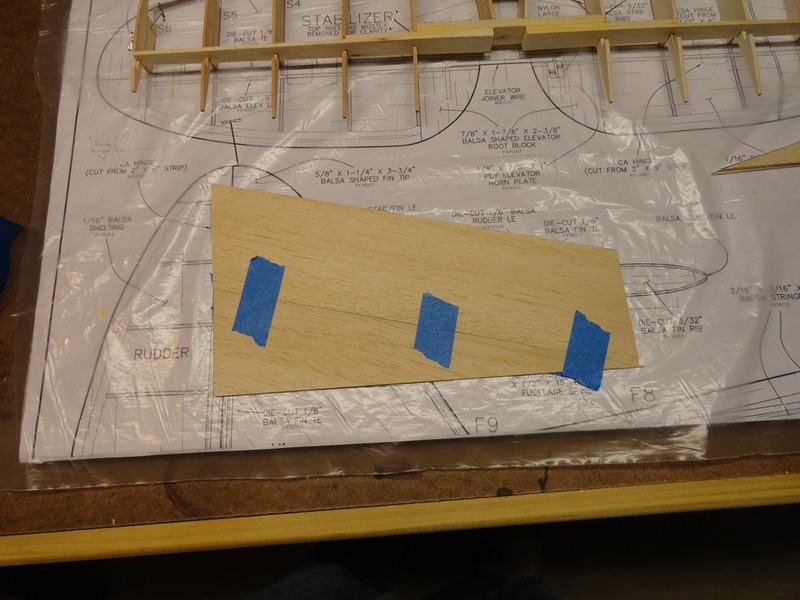 I then sprayed the outer surface of the leading edge with Windex (the ammonia in the Windex helps loosen the fibers and softens the wood more than just water) and wrapped the leading edge around a piece of 3/4 inch PVC pipe. All it takes is a few minutes to set in the curve. 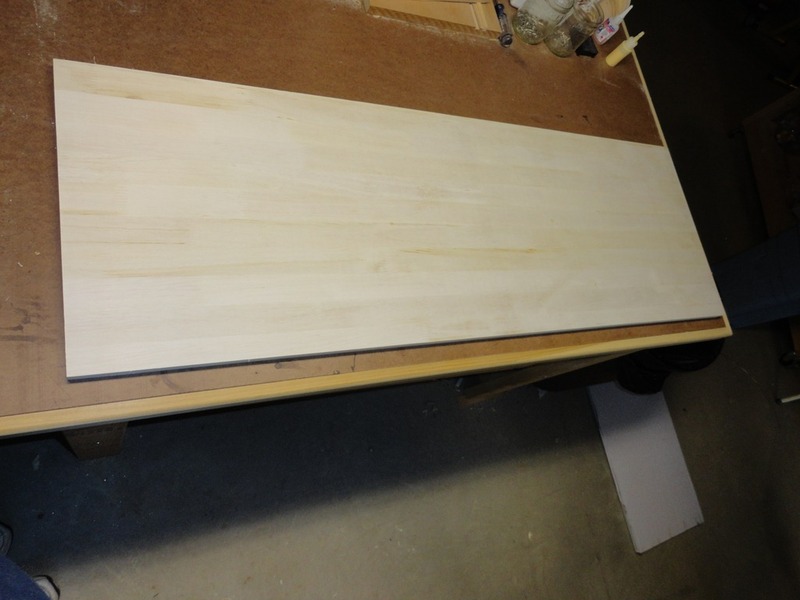 While the wood was still slightly damp, I was able to glue it in place, easily shaping the leading edge to the curve, using small t-pins to hold it in place until the glue dried. You can see a bottle of CA in the background. 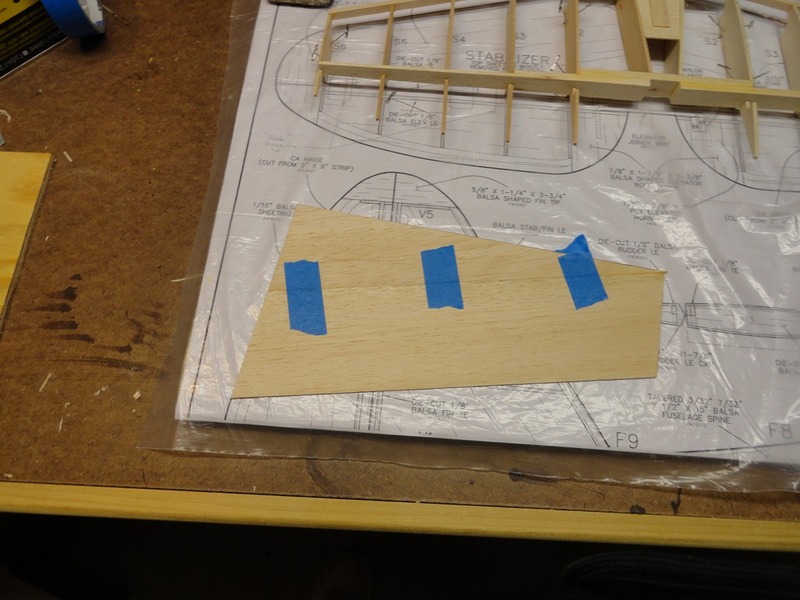 This was used to glue a small piece of scrap balsa near the leading edge to help support the joint between the left and right sheeting. 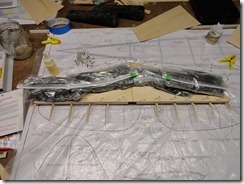 You can also see baggies filled with lead shot used as weight to help hold the stab flat while the glue dries. Hopefully I will have time for a bit more progress next week. 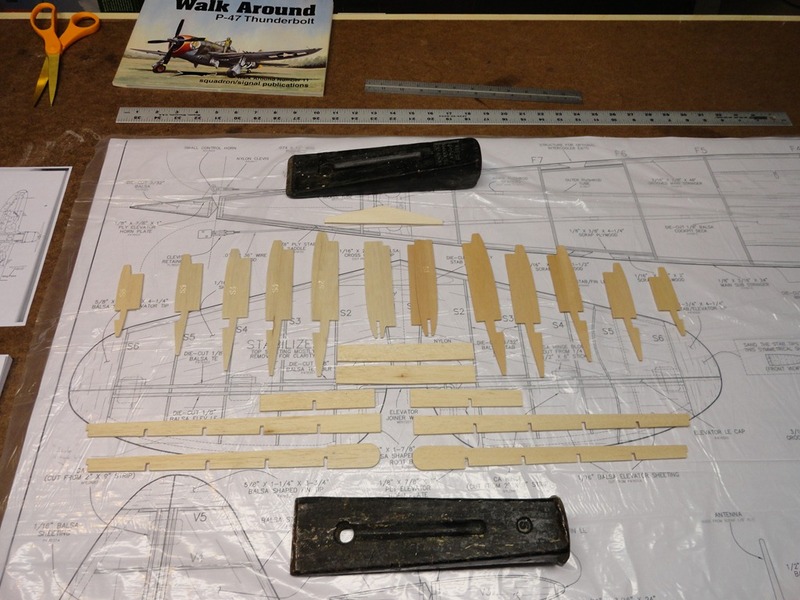 I tried out a the technique for edge joining balsa sheeting described on the Airfield Models website on my TF P-47 build. 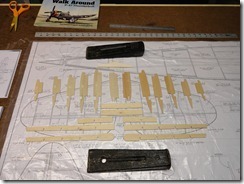 Note: If you have not checked the Airfield Models website, I highly recommend it. A wealth of information and some truly impressive work. The technique is easy and quick and produces a strong joint. 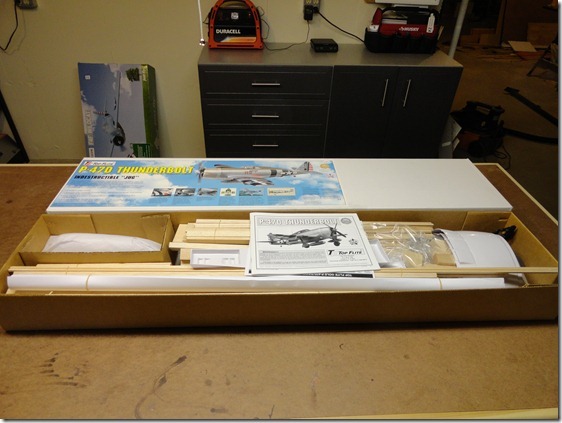 I will summarize the process, but suggest you read through the full description here. The key is the use of standard model airplane cement (such as Ambroid) in place of CA (which is hard to sand) or aliphatic resin (which is slow to dry). Step 1: Make certain that your edges are clean and straight. I used a single edged razor and a steel straight edge to cut pieces to the desired shape and 150 grit sandpaper on a hardwood sanding block to lightly clean up the edges before joining. 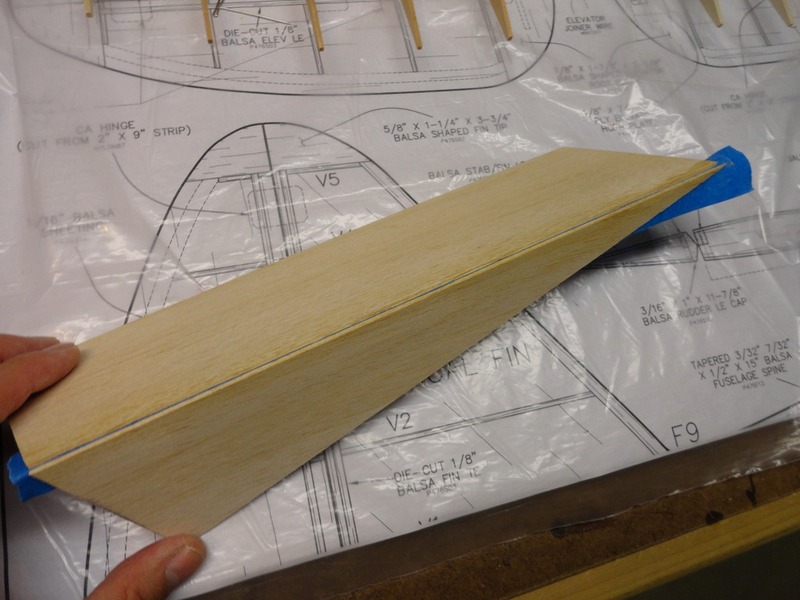 In order to prevent rounding of the edges, hold the balsa flat on your work surface and gently slide the sanding block (with sandpaper on the edge perpendicular to the bottom) against the balsa edge. 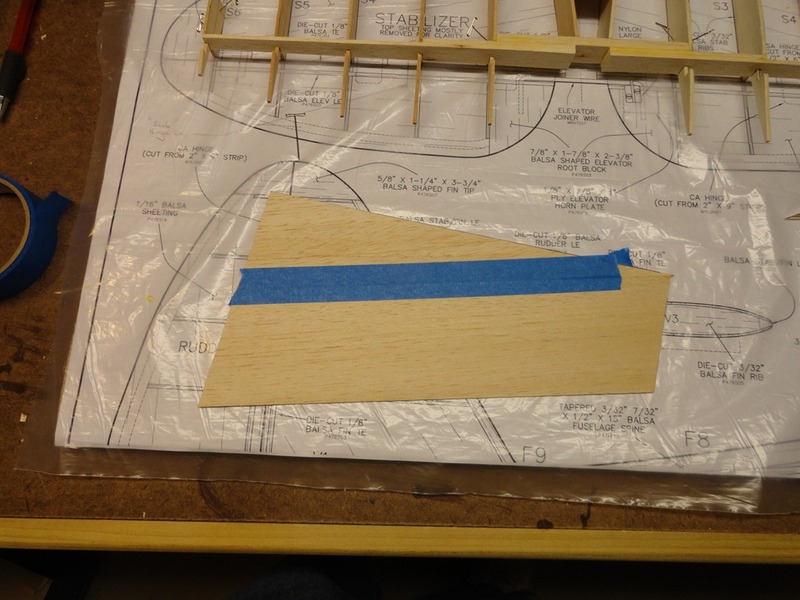 Step 2: Use masking tape applied perpendicular to the joint one one side to hold the two pieces together. The pieces should be pushed snuggly together. 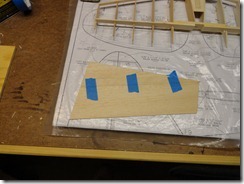 Step 3: Flip the piece over and apply a length masking tape along the seem. 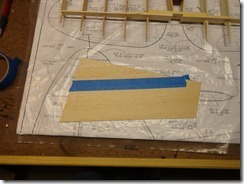 Step 4: Remove the tape applied in Step 2 and hinge the pieces back along the tape applied in Step 3. 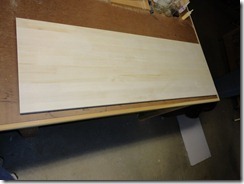 Step 5: Apply a liberal film of cement along both edges, then flatten the pieces against your work surface. Using a cloth damp with solvent (e.g. 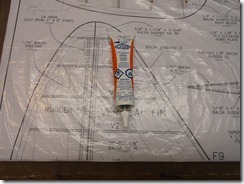 ; acetone), wipe away the excess glue that oozes out and re-tape the joint with tape perpendicular to the seem. Be careful not to use too much solvent. My first attempt, I used too much and basically washed away all the glue! 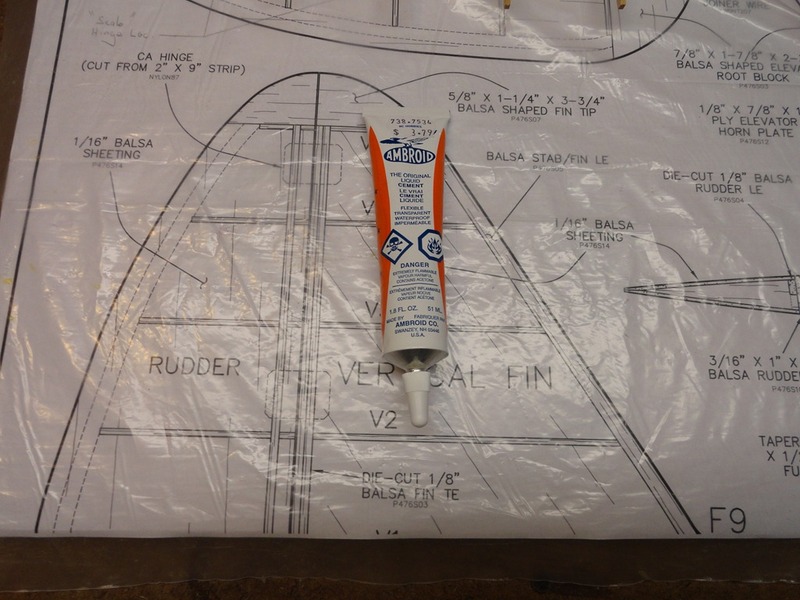 At this time, remove the tape applied along the seem and replace with tape perpendicular as well (this allows the glue to dry more quickly and minimizes the chances of solvent melting the tape glue and leaving goo on the surface). 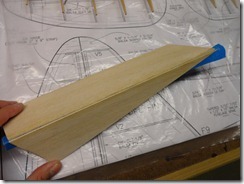 After the glue dries, remove the tape, lightly sand the joint and your done! 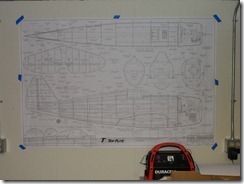 Construction of the TF P-47 officially got under way this weekend with the (where else) the stab. 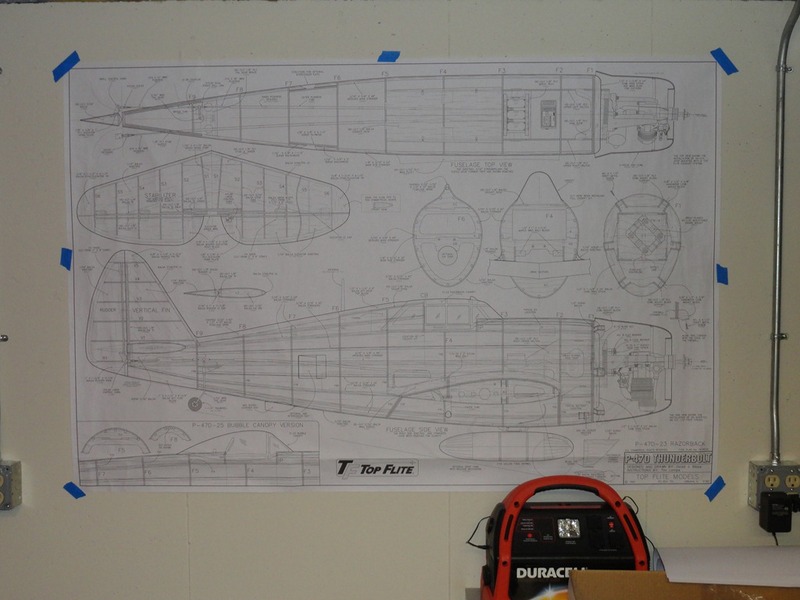 Before getting under-way, I paid a visit to the local Staples and had a full scale copy made of the plans. This gives me one set to post to the wall, and another to pin down to my building board. Also, as I plan to make some minor mods to add scale details, I wanted a set of plans I could mark up while still having the originals to refer to. Speaking of building boards I recently ordered a Great Planes balsa building board, but as it is on back order until mid-October, I have resorted to the tried and true method of using an upside down ceiling tile with my plans pinned to the surface. At this stage, I am following along exactly per the stock instructions. 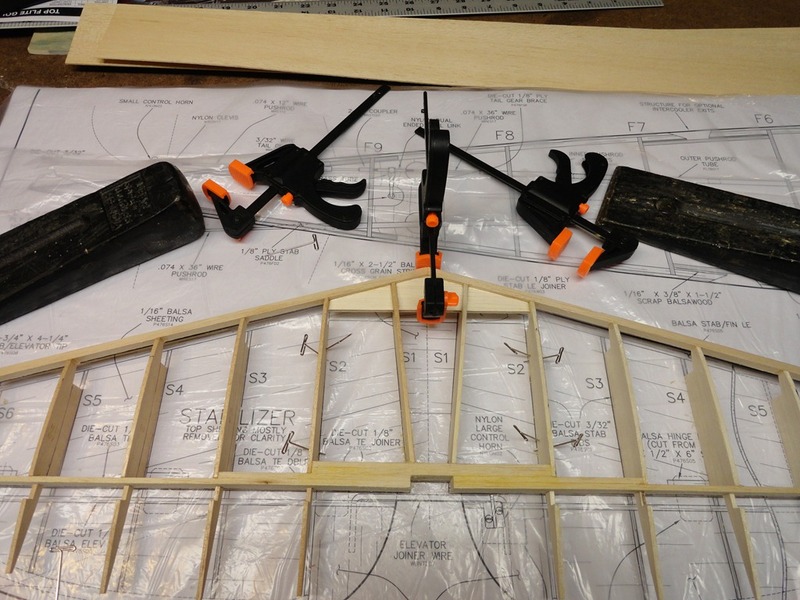 However, I have marked off the scale hinge locations on the plans and will be using Robart hinge points in place of the standard CA style hinges provided. 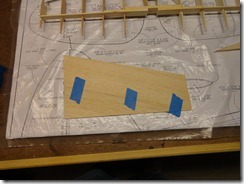 Before pinning down the ribs, I sanded a bevel on the front edge to match the leading edge sweep. 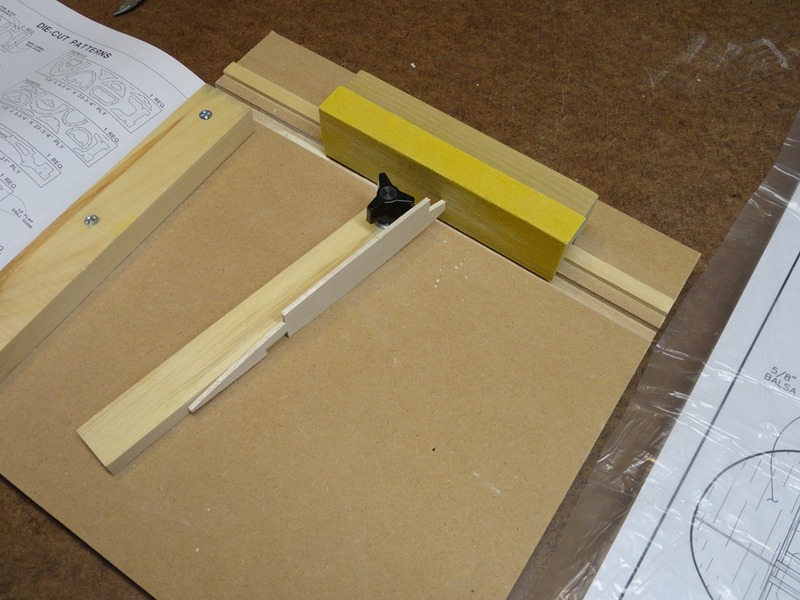 I used this angle sanding jig which I put together earlier out of scraps from old wood-working projects (you can buy a commercial product for about $25). 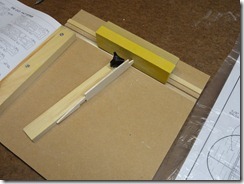 The jig lets you hold a thin wood strip at any angle relative to the sanding block and make smooth and precise bevels. The two large steel wedges are simple dead weights used to keep everything flat to the building board. Going forward, I have ordered a 25 lb bag of reclaimed lead shot from Rotometals and will use this to make up a set if weight bags. For now, the wedges will do. 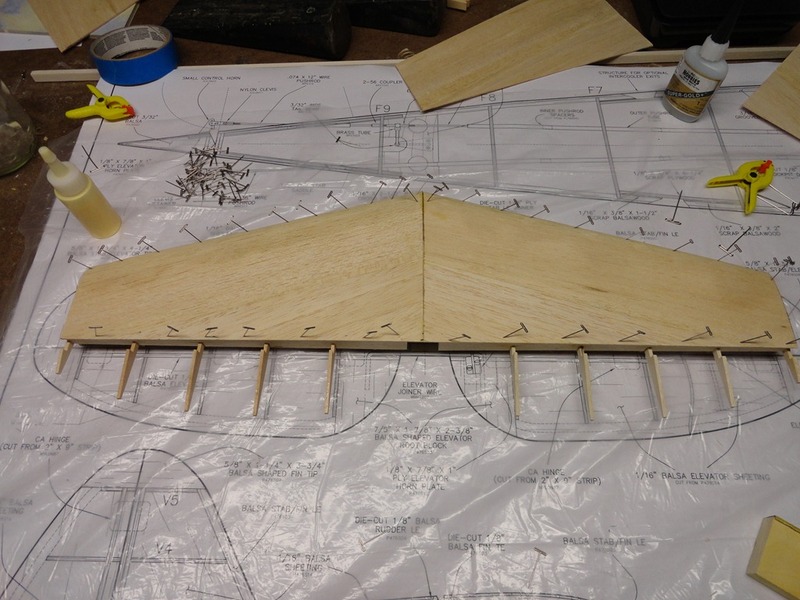 I have completed the basic stab structure and am ready to move onto sheeting. So far so good, but this is the easy part! Well here we go with the project that got me motivated to set this site up. 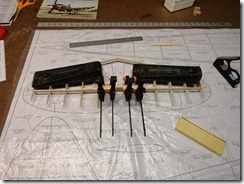 I am diving into my first scale RC build project. I may have bit off a bit more than I can chew, but I have realistic expectations and realize that this will be a lengthy project (probably on the order of 2 years). In fact I am counting on it as my flying skills are not quite up to a scale warbird such as this. 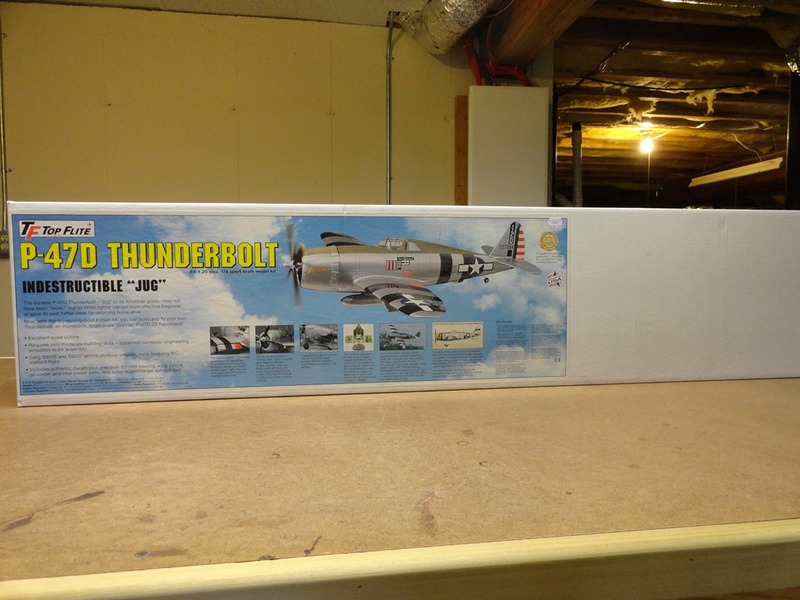 That said, even though this is my first scale RC build, I have quite a bit of model building experience in my past and I am confident that I will eventually see this box full of lumber take flight. 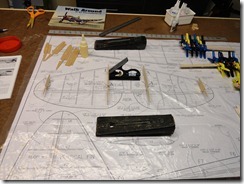 My plans are to build this close to stock, adding a few additional scale details where I can. One major deviation will be to use electric power instead of gas or glow. 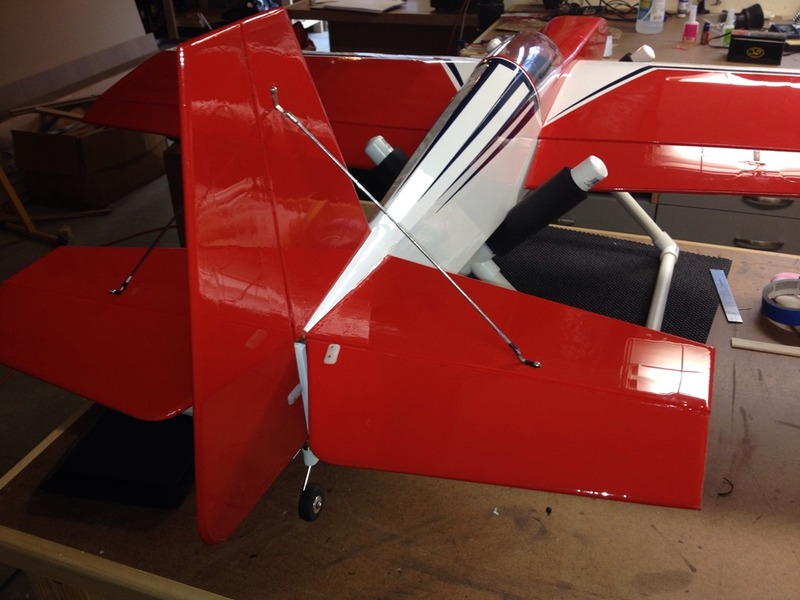 I definitely plan to include retracts (including the tail wheel). 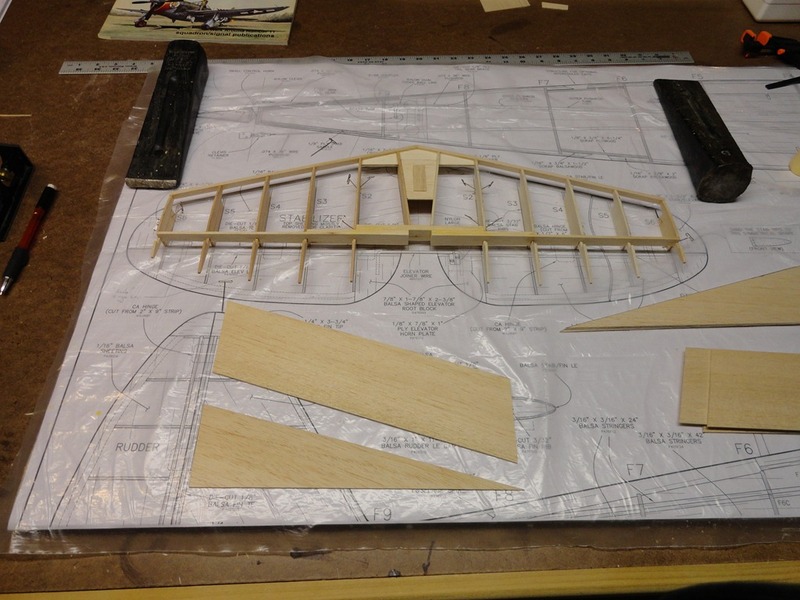 One of my early decisions will be whether or not use larger scale wheels and doors for the main gear, which will require extensive modifications to the wing spar. 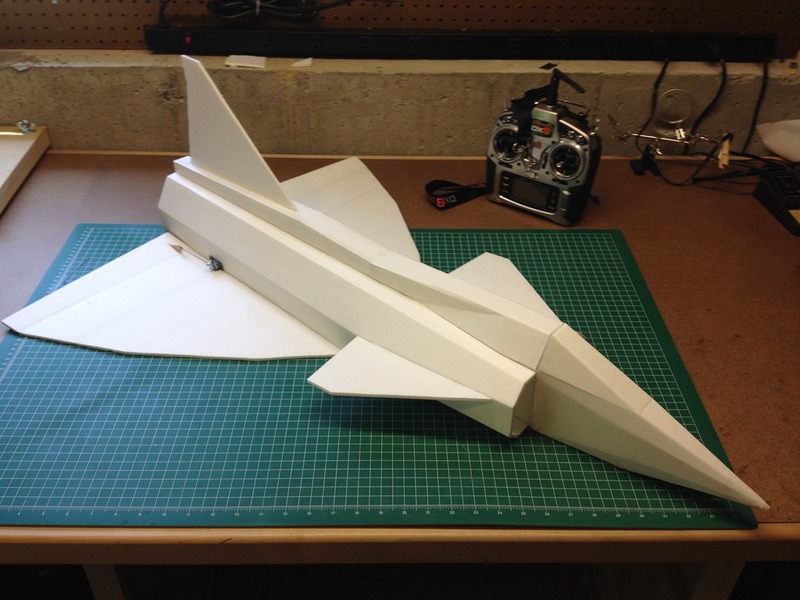 Other plans include functional flaps and using hinge-points instead of CA hinges for all control surfaces. 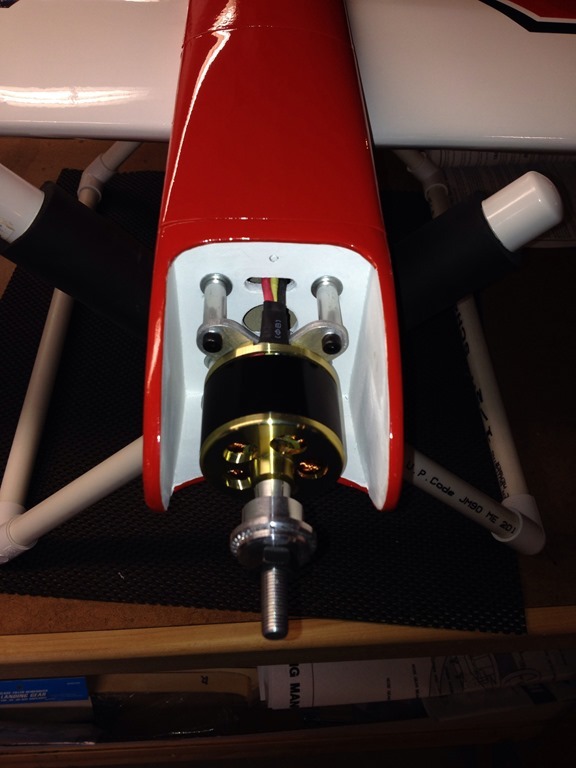 I am leaning towards fiberglass and paint instead of traditional film covering, but not certain if that yet. 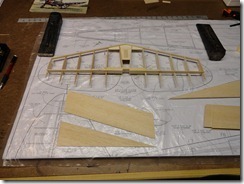 I hope to start construction on the tail feathers next weekend. Well here we go, this is my first ever blog post! I am very excited to have this site up and running and to use this as an opportunity to document my experiences. As this is such a niche site in the overall context of the “World Wide Web”, I am not expecting much activity, but I am hopeful that others who share my passion for this hobby will find this site and find something interesting or useful here. Even more, I am hoping that I may have an opportunity to learn something from others who visit and leave comments of their own.